Here’s a photo from our show in New York at The Bowery. What a great night! This is going to be our final tour until the 2016. If you didn’t already know, we’ve put out our ‘debut’ record this year called The Gates and have been touring it since the spring. There are still a lot of Canadian markets that we haven’t had the chance to play yet, so we really hope to get out to see you all soon. We’ll also be back in the US in the springtime. 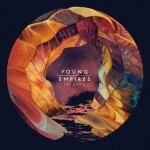 This post was written by Matthew Vlahovich of Young Empires, as part of their Takeover of Indie Music Filter. Follow them on twitter here. Hey IMF readers. It’s Matt here again from Young Empires. I wasn’t able to source a photo from our show with Dragonette. Instead I’ve included a photo of what it feels like to tour with them. Yes, heads on fire! I’m continually impressed, but more importantly, inspired, by Martina’s endurance and stage energy every night. If you haven’t had the chance to see them live, I’d highly recommend it. In fact, we’re touring in Canada over the next three weeks, in most major cities. So, come check out a show. Also, I’m really excited to share with you our very new music video for “Uncover Your Eyes.” Just a quick warning – it’s pretty intense and some of you may have an adverse reaction to the video. But at the end of the day, this video did exactly what we wanted it to. The song itself is a light indie-pop track that’s very melodic. But the underlying theme is heavy and emotional. It was fair to balance this, or juxtapose with, a visual that was from a difference perspective. You could say, from a ‘darker’ angle. Anyway, I’m digressing here. Check out the video below and let us know what you think on our socials. Xo.